New 59″ RainSaucers now available. – Wind resistance via cables installed underneath. – Works only with open top circular barrels (not included). 22″ width recommended. Examples include open top drums and Roughneck™ and Brute™ cans. – Stores flat or via hook through edge hole. – System comes with 4 parts (RainSaucer, fasteners, filter, and cables). 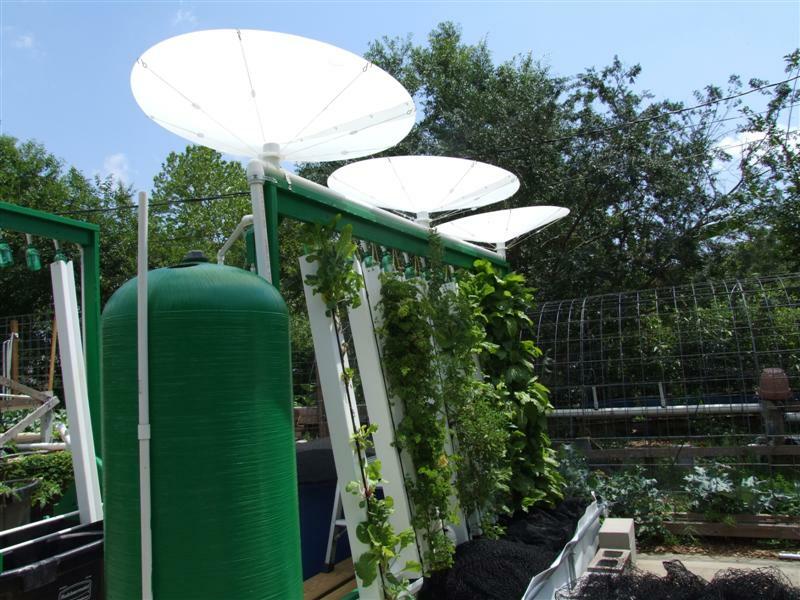 The RainSaucers™ system is a patent-pending, low cost, easy to deploy RWH system that catches rain straight from the sky. The RainSaucers™ system has a small enough footprint to facilitate deployment anywhere. Since the catchment mechanism is removable, it can be easily cleaned or stored when not in use. The system works with any barrel or tank. Barrel Not included. – Saucer made from food grade, UV resistant Polypropylene. – 2″ NPS threaded male fitting. – Strong wind resistance via retention ring and cables. – Works with any barrel (not included) that has native 2″ NPS fine thread hole or one installed by bulkhead fitting or compression gasket (ask your barrel retailer). For confirmation, what is the height of the rain saucer and the volume when in cone form? How much water does the cone hold if filled? Thanks! The cone is not going to hold water, it is not sealed. The Saucer is also not sturdy enough to support being full of water, that would collapse it if you were to seal it up. However, if it is just a theoretical question, when in cone form it is about 46 inches across and 6 1/2 inches high. When is the next generation coming out? I will need these soon, and hoping you can get a suppy in quickly. Can you give me a rough time line? I’d like to use these with a Water HOG, and rain barrels. I’m hoping to get some to check out here in the next several weeks and I’ll definitely post when I have them available. What is going to be different in the next generation saucer? Funny you should ask, I just got a message from the makers of the product. The next generation will be HDPE plastic with some UV protection so that it will last longer out in the sun. I will hopefully have some to test out shortly. Is there telephone number where I can reach you? I’m interested in the latest version – I believe it’s 59 inches. If you have them, I would be interested in purchasing two. Can I purchase these using a credit card? I’m in Boca Raton. Hello Steve, I tried e-mailing you with info on the Rain Saucers but I haven’t heard back from you. Phone service here at the farm is pretty spotty and I can’t take credit cards over the phone anyway. I only take credit cards through paypal at this time. I have not gotten to test out the new RainSaucers yet myself so I can’t really comment on them for use here in FL yet. I don’t have any in stock at this time but if you really want them, please contact me and I’ll see what I can do to make arrangements to have some shipped direct from the manufacturer to you. I want to order a Rainsaucer. Please contact me when the product is available. I tried to e-mail you Heidi but it came back as undeliverable? Where are you located? I might be able to order the new product now, I’ll have to check. If I know where you are located it would help be know if I have to get the product shipped to me and then re-ship it or if I could simply have the manufacturer ship it directly to you. unfortunately I do not have any barrels on hand to sell, those are normally best gotten locally since the shipping on them is outrageous.